March 10: Daytona Flat Track I - Daytona International Speedway, Daytona Beach, Fla.
March 11: Daytona Flat Track II - Daytona International Speedway, Daytona Beach, Fla.
May 14: Arizona Mile - Turf Paradise, Phoenix, Ariz.
May 21: Sacramento Mile - Cal Expo Fair, Sacramento, Calif.
May 29: Springfield Mile I - Illinois State Fairgrounds, Springfield, Ill.
June 18: Oklahoma City Mile - Remington Park, Oklahoma City, Okla.
July 30: Charlotte Half-Mile - Charlotte Motor Speedway, Charlotte, N.C.
August 9: Sturgis Half-Mile - Black Hills Speedway, Rapid City, S.D. August 14: Peoria TT - Peoria Motorcycle Club, Peoria, Ill.
September 4: Springfield Mile II - Illinois State Fairgrounds, Springfield, Ill. Differences: a return, after a few years, to Arizona, Oklahoma and proposed race in NY State. No Delaware, no Castle Rock, no DuQuoin. No Indy Mile, either, but a race at COTA in Texas the same weekend as MotoGP and the Handmade Show. I hope whichever track they use is better than it was for the X Games that was in the COTA facility last year. In other news, we've heard a rumour that now even the all-leathers rule has now been shelved for 2016. If it's true, the governing body are doing more U-turns than a London taxi. AMA Pro Racing is committed to developing a healthy future for all the passionate and professional members of our community. I mentioned last November in Las Vegas that we have a large number of challenges and opportunities in play at the moment in our sport. As we tackle the issues surrounding building a bigger fan base, attracting new corporate sponsors and engaging the OEMs to actively partner with us, there are and will be a number of questions that require analysis and discussion. Sometimes the right path can only be determined by giving air to the spectrum of experienced views within our paddock. It is with this in mind that we are seeking to establish and grow a new Advisory Group, comprising Riders and Team Members from our professional flat track community. I hear a lot of informal and anecdotal intelligence from all corners of the paddock and I know that AMA Pro Racing can benefit from a formal channeling and thorough cross-examination of those views. AMA Pro will organize regular meetings and administer the agenda. The meetings will kick off in March, with the first scheduled to be held during Bike Week in Daytona. We will follow that with 3-5 further meetings, in conjunction with GNC races, during the rest of the season. Do you have views and solutions for how we retain the classic Peoria TT once the GNC1 Class becomes twin-cylinder exclusively? Can you help us ensure that the balance between new technology and cost control stays in the 'sweet spot'? Are there better ways to execute the paddock load-in and manage the race weekend? All these questions and more will be addressed as we prepare for modernization and development in 2017 and beyond. I'll be interested to hear who puts themselves forward. They need people who can demand respect, but also younger guys who look at things differently. 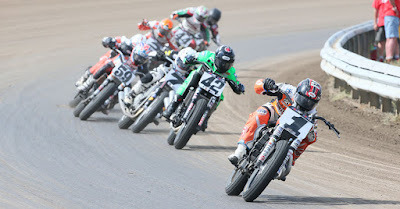 AMA Pro Racing seem to be locked in a damned if they do and damned in they don't situation. If they suggest a change, half the paddock moans about changing things, but if they don't everyone complains that revenue and sponsorship is down. Meanwhile, most manufacturers (the OEMs Lock speaks of) - with a couple of exceptions, pay only lip service to the sport, making big budget concepts to splash on social media, but not actually backing any teams. It's a mess. Indian are supposed to be coming soon. That will be good and it is likely to mean Harley-Davidson will put even more effort and dollars into the sport, of which they are already one of the biggest, if not the biggest, supporters. Hopefully they will both bring some third party sponsors like drinks or oil company money and the increased marketing companies like that shine on the sport. The excitement a comparatively low budget effort like the Scrambler rebranding of the Lloyd Brothers team, and the inclusion of a way off the pace, Troy Bayliss made last year shows that motorcycle people are desperate for dirt track stories. Imagine if a team brought back Nicky Hayden, or if Yamaha rolled out a title contender in full Roberts-style speed blocks. Babe DeMay could make it work, he's doing it on a shoestring already. they must be using the same managerial philosophy that british speedway has been pioneering for the last ten years!! No Hagerstown either! Interstingly, there is an open block of time from June 25 to July 30! The Hagerstown race has been historically near July 4. Last year, they had it scheduled earlier, around June 20 or so, and it was rained out. Upon checking the Hagerstown Speedway schedule posted on their website, it shows Sat July 2, 2016 as a "music concert". I've never know them to host musical acts; I almost wonder as if this date is tentative. Being born in Hagerstown, I hope to be part of the GNC circuit again!